A multitude of talent came to the fore when the staff and teachers of NK Bagrodia Public School, Dwarka celebrated Children’s Day and had a special assembly on Guru Purab. Days are celebrated to make the students feel special about the occasion. So to leave an indelible impression on the minds of young Bagrodians, the teachers conducted the assembly for the occasion. To add international flavour to this beautiful morning, the French delegates also graced the occasion. The assembly commenced with prayer followed by information on the children’s day alongwith news on national and international affairs. To mark the birth anniversary of Guru Nanak Devji, tiny tots of the Montessori wing came dressed up as ‘Panch Payare’ and recited Guru Mantra and few couplets from the Holy Book Guru Granth Sahib. 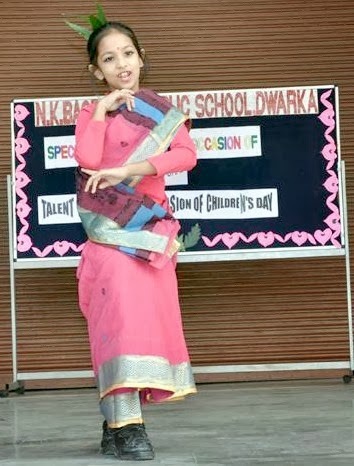 The entire world descended on the stage of NKBPS Dwarka when dreams transformed into thoughts and thoughts resulted into actions by teachers. Fully charged with spontaneity and fervor, the torch bearers of the school gave a scintillating performance titled “DREAMS COME TRUE”. The ground reverberated with thunderous applause by students for their educators. The assembly consummated with the Principal Madam Dr (Mrs) Rajee N Kumar taking the lead in National Anthem followed by Ms Satinder Singh, the Head Mistress, Ms Aruni, Ms Syeda and Ms Richa, the three in-charges of the three wings.